Organising a dinner party can be stressful and fun in equal measure. Deciding who to invite and what to serve is all part of the process but one area that is often overlooked and completed in a hurry at the last minute is setting the table. Depending on what sort of party you are having you can choose from a number of different table placements, but the impact of having a beautiful set table should not be underestimated. The basic table setting that is appropriate for most dinner parties just needs a few basics. 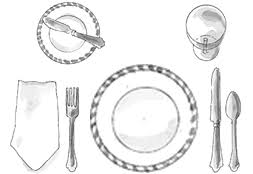 Any dinner plate that is being used in placed in the centre of the place setting and then any cutlery is placed around it with the fork located traditionally on the left, the knife and spoon to the right (knives and spoons are always placed next to one another with the spoon on the outer side). When placing the knife next to the plate you should make sure that the blade is positioned towards the plate. A standard glass that will be used for water should be placed just above the blade of the knife. If you are going to be having a dinner party that perhaps consists of more than one course you may wish to change your place settings to a more luncheon style format. This means adding a bowl to the top of the dinner plate – you should always add a napkin underneath this, a side plate to the top left of the dinner plate with a small knife placed on top and either a wine glass or a cup placed to the right of the water glass. When it comes to a starter if you are serving a salad you should add a salad fork to the left of the dinner fork. The most important thing to remember when holding a dinner party is to have fun. 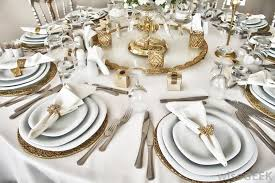 Your guests don’t want to have an impeccably prepared meal sat at a beautiful table if you are incredible stressed and not enjoying the company of your family and friends.